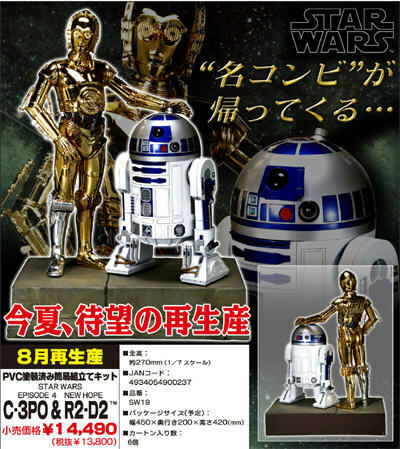 «©NCSX» Kotobukiya originally released the Star Wars Episode 4 C-3PO & R2-D2Sofubi in Japan on September 21, 2006 and the soft vinyl kit sold out soon afterwards. When August rolls around, Kotobukiya will re-release the same toy at the same price of JPY14,490. The renditions of C-3PO and R2-D2 are constructed of painted soft vinyl (sofubi) which means they're fixed-pose but somewhat flexible if you bend their respective appendages. Please note that the toy will ship in kit form but the pieces are easy to plug together to make the scene shown on the photo to the right. The base that the droids stands upon is included in the package. This document and photos are ©NCSX 2009. All rights reserved. No reproduction in whole or in part of this document may be made without express written consent of National Console Support, Inc.